Shroud is the most personal piece that I have done to date. It addresses art and religion – two significant forces in my life that have not always peacefully coexisted. The inspiration for Shroud came from the Richard Avedon Portraits exhibit at the Metropolitan Museum of Art in 2003. I came around a corner in the exhibit and was face-to-face with Avedon's portrait of Andy Warhol. 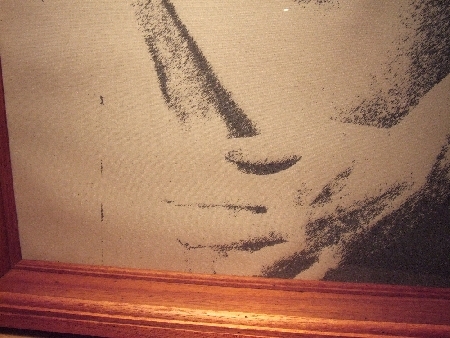 I had never seen this portrait of Warhol before and it immediately reminded me of the Shroud of Turin. »You can see Richard Avedon’s portrait of Andy Warhol Here. »You can see pictures of the Shroud of Turin Here. I left the museum with the idea of combining the two images. I spent a while thinking about how this could best be done and eventually, I interjected myself into the process as it became a self-portrait with elements of both images. Production began with a digital photograph of me in the same “pose” as the Shroud of Turin. The photo was then cropped to match Avedon’s portrait of Warhol and passed through filters to make it look more like the shadowy images on the Shroud of Turin. Scars were digitally added in a pattern similar to Warhol’s. The modified image was used to create a life-sized positive print on acetate that was burned onto a silk screen emulsion. A screen print was made on muslin and mounted in a mahogany and glass case. Can the two be reconciled in my life? 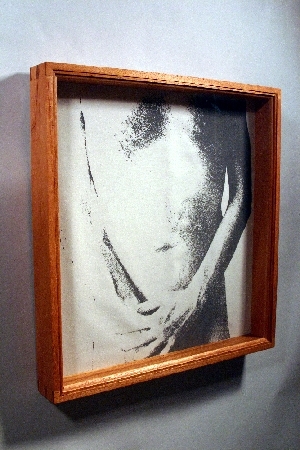 Shroud appeared in the National Prize Show of the Cambridge Art Association in Cambridge, MA (2006). A shadowy negative image is visible on the screen. This was my first time working with mahogany. It responded well to both power and hand tools. 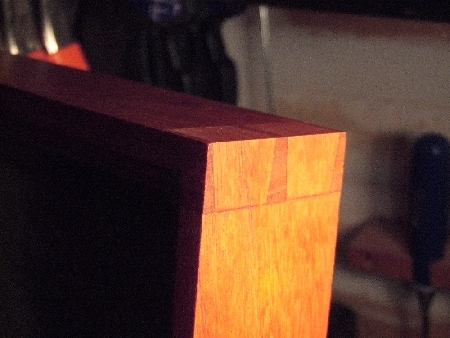 I make chunky "medieval looking" dovetails.